New Delhi, Feb 11 (IANS): Finance Minister Piyush Goyal on Monday said the NDA government has done a lot to improve farmers' economic condition and refuted the criticism on the Rs 6,000 annual direct income support to them being meagre as the Lok Sabha approved the interim Budget. "About 12 crore farmers getting Rs 6,000 each year, which translates into Rs 7.5 lakh crore in a span of 10 years, is not small by any means," he said, adding the government has earlier provided higher minimum support price (MSP) for 22 crops and that there has been marked improvements in the condition of farmers with steps like Ayushman Bharat. 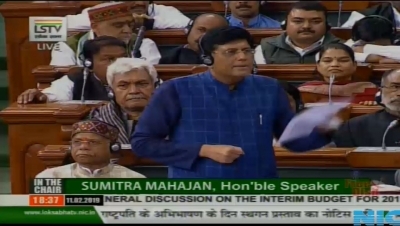 Goyal also refuted the criticism that the government has presented a full Budget in an election year, saying "we have not announced any new scheme for the next year's Budget. "Rather in 2014, the then UPA finance minister, without waiting for a regular Budget, had cut the duty on SUVs and big luxury cars for the rich while tinkering with the tax rates which is unusual in the interim Budget. Is an SUV car purchased by the middle class or farmers?" He said Congress only brought one announcement in their 10 years from 2004-14 --farm loan waiver of Rs 60,000 crore. Even that was not provided in the budget and the actual number was brought down to Rs 52,000 crore a year later, he said.